Vancouver Pen Club: August meeting photos! We had good turnout for our meeting held on August 18, 2016 at Perks pen store on Cambie Street in Vancouver----17 members (including three newcomers---Marzieh, Justin and Terry) showed up, as well as one out-of-town guest (Bill S. from the Seattle Pen Club). 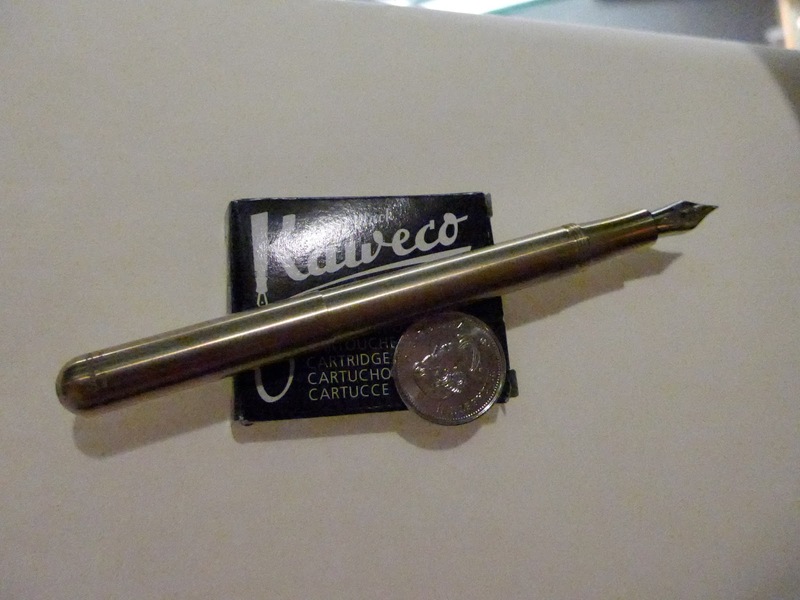 Special thanks to David R for his generous donation of a Kaweco "Liliput" fountain pen for our door prize; the lucky winner was Christopher R! 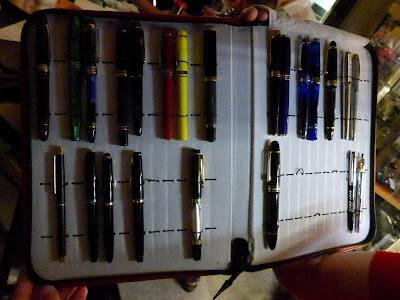 The evening's topic was "Your Favourite Lesser-Known Fountain Pen Brands". (~CLICK ON IMAGES TO ENLARGE~). 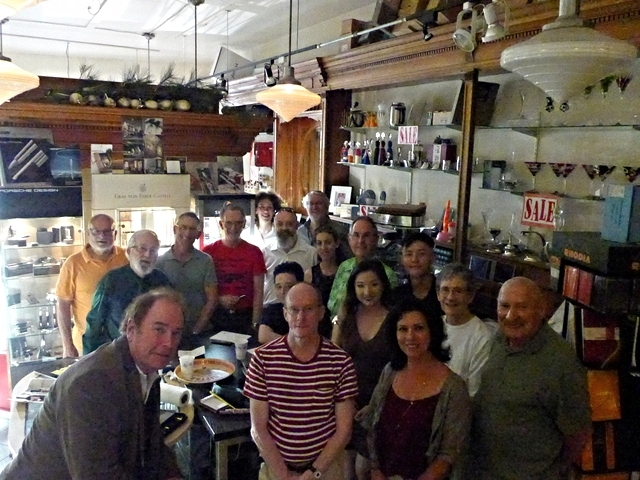 Back row (L to R): Glenn M, Terry, David R, Bill S (from Seattle), me (Maja), Justin, Barry K, Bethany, Ralph (in green shirt). Middle row (L to R): Jerred, June, Bart, Louise. Front row (L to R): Christopher R, Stuart, Marzieh, Norm. 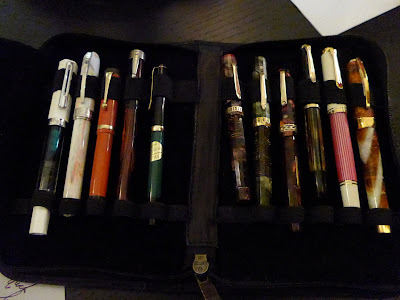 The theme for August's meeting was Jerred's idea, so I'll start with a quick shot of the fountain pens he brought in. 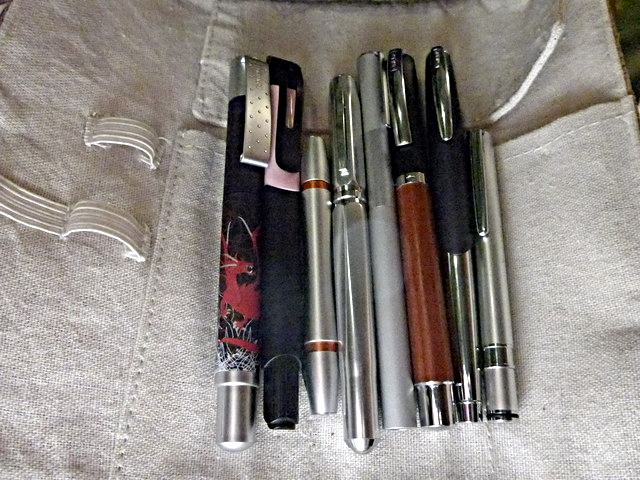 Pictured below (from left to right): Online Campus Red Dragon, Online Academy Soft Pink, Ohto Rook, Ohto Dude, Muji Round Aluminum, Online Vision Nature Rosewood, Online Icone Midnight and Ohto Tasche. 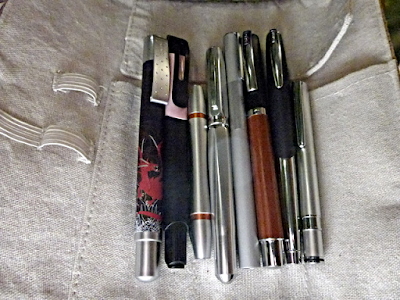 In the photo below, you can see Stuart's examples of his favourite lesser-known fountain pen brands---a couple of Heiko fountain pens (including a model '442') on the far left, a brown marbled Penco fountain pen next to the Heikos, two Ingersoll metal fountain pens in the middle of the photo, and two Esterbrook 'J' pens on the far right. 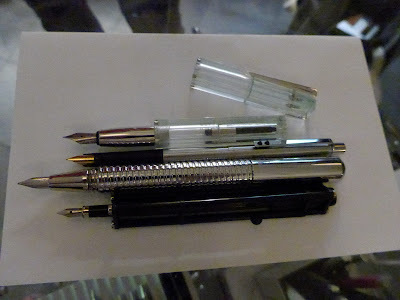 The Wahl "All-Metal fountain pen to the right of the Penco, the Sheaffer "Balance" next to it and the Pelikan MK10 next to the Balance are all new acquisitions of Stuart's. I often marvel at the enthusiasm of our members. One of our members (Harry) who couldn't attend the August meeting sent in these photos of a Penol 'Ambassador Jr' as one of his favourite lesser-known fountain pen brands. 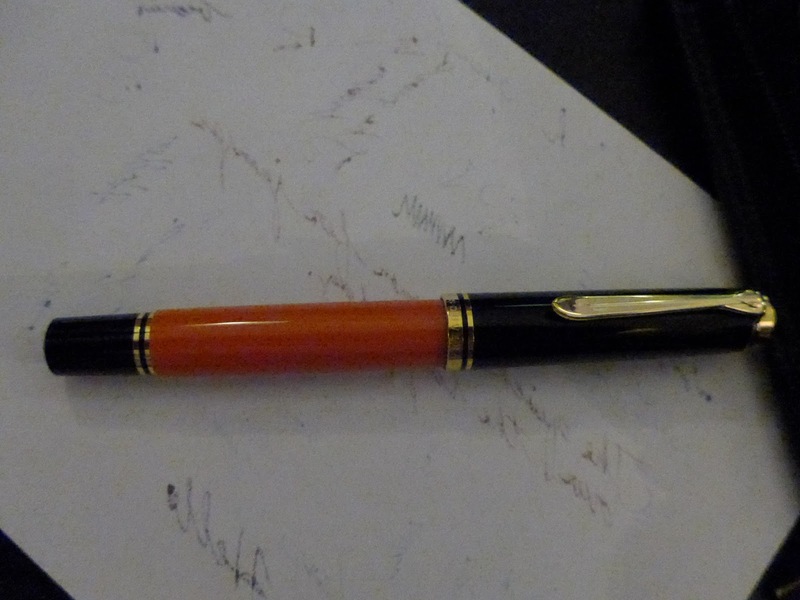 As Harry writes: "I thought I'd share a few photos of one of my pens for the uncommon brands topic. The pen I'd like to share is from the Copenhagen based brand Penol. The name comes from the combination of "Penn" and "Olson", and was made by the Christian Olson factory. 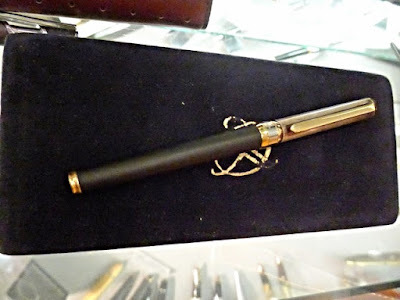 Olson was the Parker distributor for Scandinavia from before WW1 until late in the century. 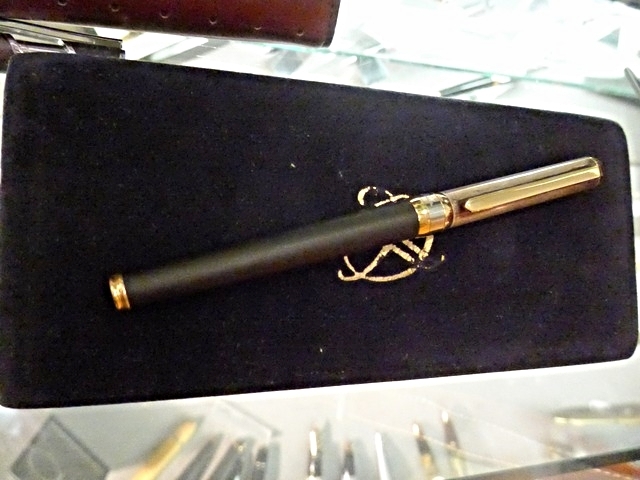 The pen model is Ambassador Jr, and was made in November, 1942. I found it in a vintage shop in Denmark. It writes like a dream!". 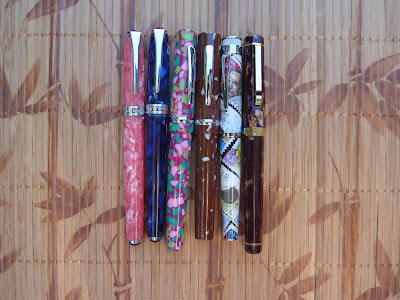 June's lovely collection of modern and vintage fountain pens, including her newest acquisitions, the three vintage Eversharp 'Doric' fountain pens (the 6, 7 & 8th pens from the left) and a Visconti 'Opera' (the last pen on the right-hand side). 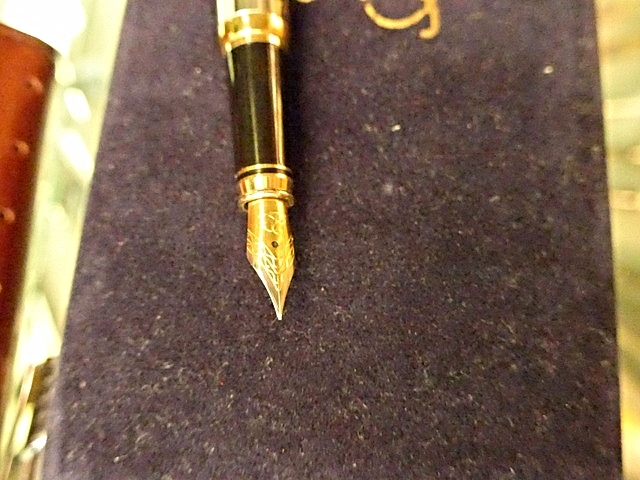 The brass Kaweco "Liliput" fountain pen that David R donated as a door prize. You can see how small the pen is, based on the size of the coin next to it. My apologies for the quality of the pics---the store's lights were turned off in order to keep the temperature down, as it was a very warm evening. 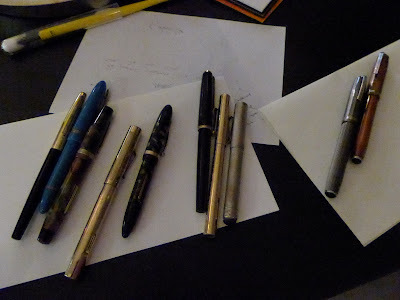 The photo below shows Bill's "daily user" fountain pens. 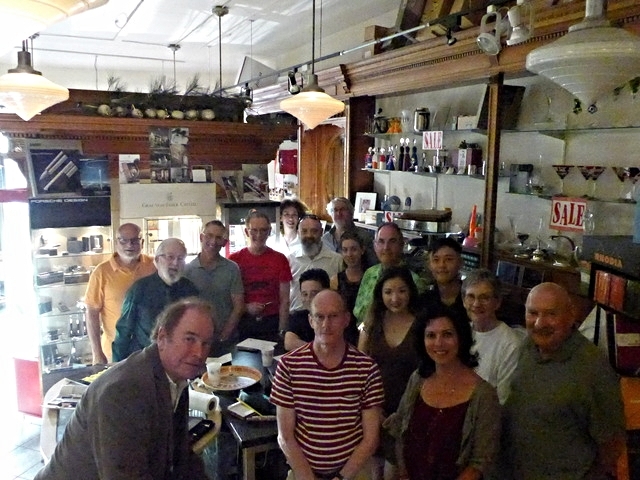 Many thanks, Bill, for bringing your collections for us to see! One of our brand-new members, Terry, brought in his collection for us to see. 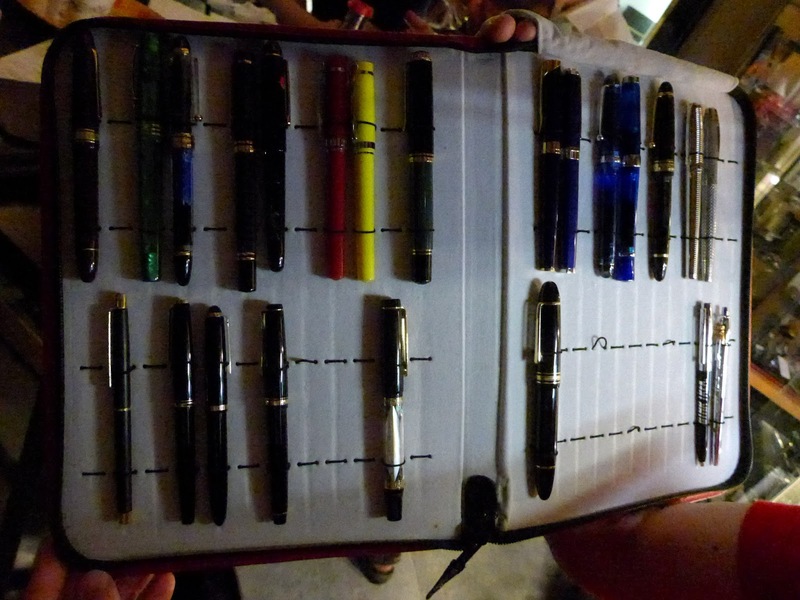 It included several nice Waterman fountain pens (a "Laureat", a vintage hard rubber mdoel "94" in the rare blue ripple, and a gorgeous vintage all-sterling-silver model), a Waterford fountain pen, and a fountain pen that doubled as a Holy Water dispenser! 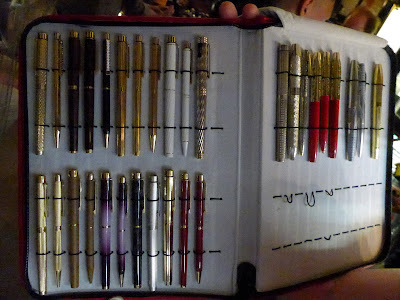 Terry left a bit early so I didn't get a chance to photograph his fountain pens. I also meant to photograph Glenn Marcus' newest fountain pen inks, his two bottles of kyo-no-oto ink, but the photographs on his website are infinitely better than anything I could take :) You can find Glenn's review of this ink on this page . ~~~~~~~~~~~~~~~~~~~~~~~~~~~~~~~~~~~~~~~~~~~~~~~~~~~~~~~~~~~~~~~~~~~~~ Don't forget about our September meeting this week! It's on Thursday September 15, 2016 from 6:30pm to 8:30pm (members may arrive a little bit early---at 6:00pm---to chat beforehand) at Perks pen store, 5844 Cambie St, Vancouver, BC (the usual meeting place). 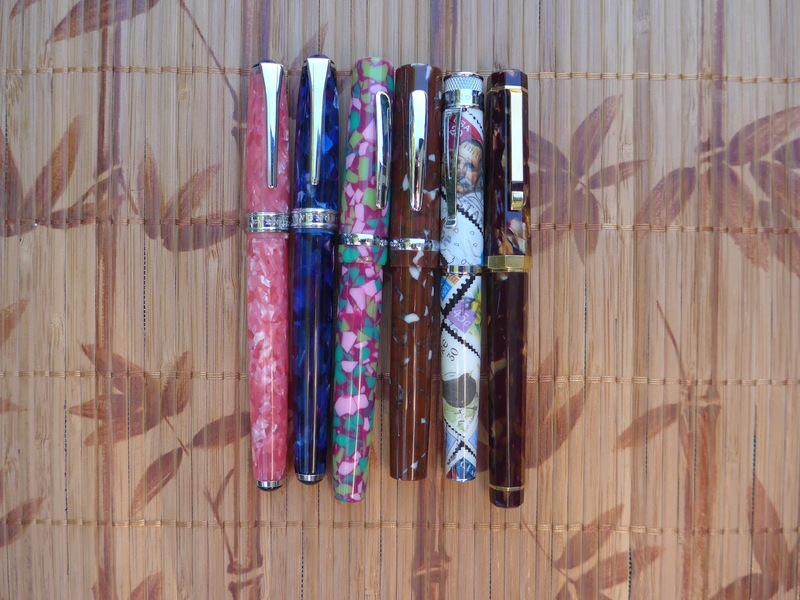 The topic will be BLUE FOUNTAIN PENS! 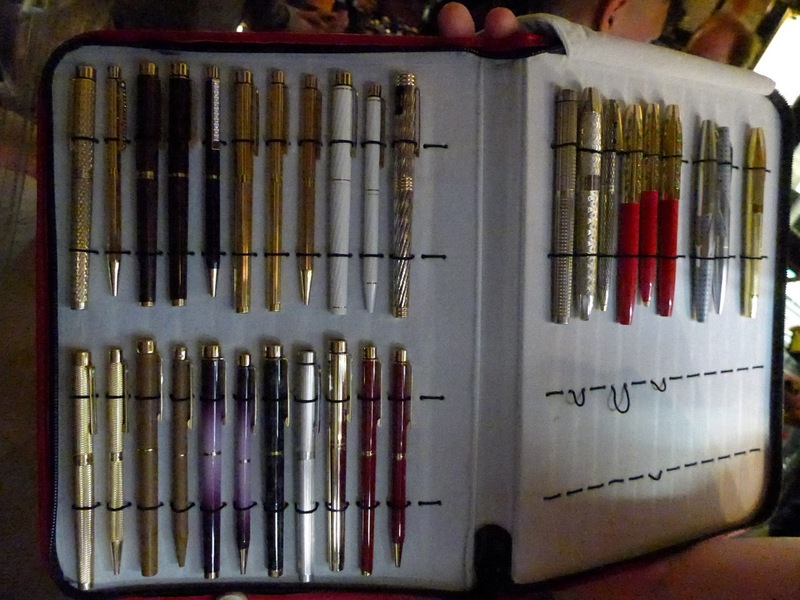 No RSVP's required for meetings held at Perks pen store. Hope to see you there!